100 amp/hr battery with charge controller. Standing rigging: Vectran on shorter mast, S/S on taller mast. Genoa: 18.02 sqm maxx pentex laminate, MT UV resistant, cross-cut. Genaker: 64.2 sqm Tri-radial upwind type 1.5 oz Bainbridge. complete with stepping gear. The taller carbon mast is currently fitted and the shorter mast is rigged and ready to use if required. The large mainsail fits the smaller mast with the first reef in. Boom: Carbon fibre, white Awlgrip paint. 20 l fuel jerry can. 2 x Anderson 40 T 2-speed winches. Built in China under the supervision of the original owner, the GRP mouldings were then shipped to the Netherlands where she was completed to a high standard. This fast and lightweight Kettering JE 29 Tri has very shallow draft of only 0.3 m with the dagger board up. The mast can be lowered while underway, making it capable of passing under low bridges (such as the Sarasin Bridge between Phuket and mainland Thailand) Just rewired, she comes complete with a custom-built road trailer. and shorter cruising mast. 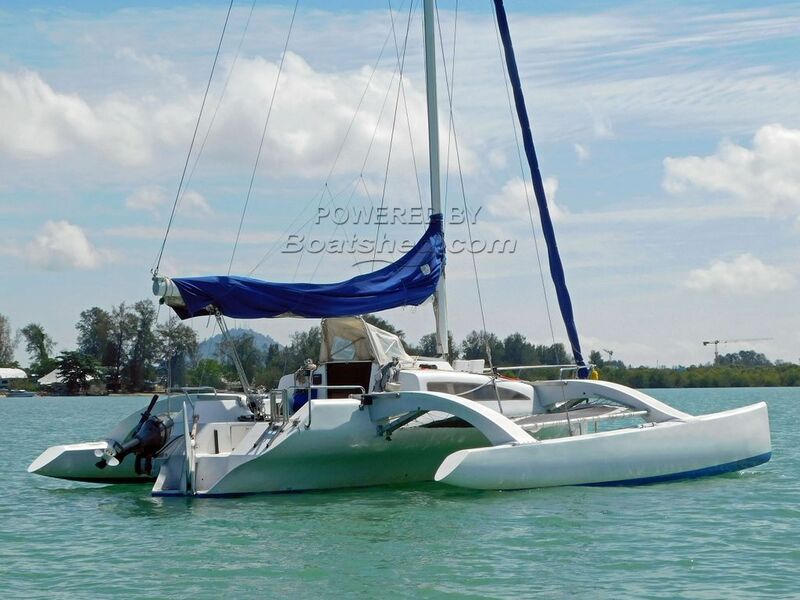 The owner who now finds himself unable to sail her will listen to all reasonable offers. This Kettering JE29 Trimaran has been personally photographed and viewed by Alan Giles of Boatshed Phuket. Click here for contact details.